1. How does one obtain an agent? There are a number of annual reference books that list the leading literary agents, such as The Writers' and Artists' Yearbook, The Writer's Handbook and Guardian Media Guide. Many agencies now have web-sites and the newsletter of Agent Research and Evaluation Inc(334 East 30th St, New York,NY 10016) assesses the strengths and weaknesses of agents on both sides of the Atlantic. There are numerous writing magazines, such as Writer's News and Writing Monthly, with tips not just on writing books but also placing material. 2. How do agents obtain authors? Authors come through the most circuitous routes and for the most extraordinary reasons. One told me recently he had selected my agency because it was conveniently near Victoria Station! Most come on personal recommendation from an author, editor or even another agent (since we all have different specialities and some agencies are more acquisitive than others). Authors may read articles by agents, hear them speak to various organisations or, if they have famous clients, may read about them in the papers. Sometimes we approach public figures or someone we have read about in the paper, who we think might have a good story, and offer representation. Agents handling more academic writers may check recent theses' lists for potential subjects or writers. Many of my authors come to me having seen an acknowledgement to me at the front of what they feel is a comparable book to their own. 3. What are the usual terms of an agency? These may vary but should be 10-15% commission on sales in this country, 10-20% for film and television rights and sales through subagents in America and the translation market. Remember that the agent does not earn until you do and that it is in the interests of the agency to ensure the best possible terms. Agents may charge for photocopying but there should be no fees for reading scripts or administrative expenses. Agents who are members of the Association of Authors' Agents abide by a code of contact, have to have been established several years and have to have a certain level of turnover so it is usually better to approach them in the first instance. 4. What can an agent do for me? As publishing has become an increasingly complicated business and editors more over-worked the role of agents has grown enormously. Authors may not know which particular publishing companies to approach, nor which editors within those companies. An agent's job is to know the market and to know which editor is looking for what sort of book at any particular time. It may be there is a shortfall of fiction for the spring list, a publisher needs a major non-fiction title for the Christmas market because of late delivery on the scheduled title or simply that editor X loves travel books and is therefore likely to be very sympathetic when presented one. Every agent's relationship with his or her author is different and depends on the author's special needs. Agents often have publishing experience and are prepared to put time into shaping a manuscript or a proposal that has potential. An agent may have good media contacts and help an author to find journalistic work in order to raise the author's profile and perceived expertise on a subject or else simply to help pay the bills. Publishers often approach agents when seeking a writer for a particular subject. Producing a marketable script, placing it and negotiating a contract is only the beginning of the agent's job. He or she will monitor the publishing process to ensure the book is properly produced, sold and marketed and will take on responsibility for nurturing the author's writing career between books. An agent, though ultimately responsible to the author, can also act as a buffer between the author and editor and mediate in any dispute. Good editors like responsible agents because they act as a filtering process and can take some of the pressure off them. 5. Is an agent worth the commission? An agent should be able to raise the advance by more than their commission. They know the going rate for particular books and how to create a bit of competition to push up the price. Editors will understandably try and buy a book on the most advantageous terms and their interests are not always those of the author. Agents can also deal with the small print in a contract - the royalties, discounts, subsidiary rights splits, termination clauses are as important as the advance - and can chase and check royalty payments. Not least, they take out the embarrassment of talking directly to one's editor about money leaving the relationship one solely about the book. 6. Do publishers take books submitted by agents more seriously than direct submissions? The simple answer is yes. Publishers are inundated with unsolicited submissions and the fact they refer to it as the 'slush pile' is indicative of their attitude. Many now don't consider un-agented approaches, while few of the others use experienced readers. Why have extra costs when there is already a surfeit of good material on offer from agents? 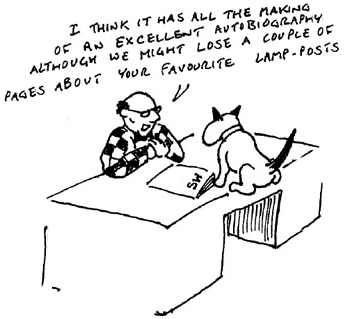 An agency, on the other hand, takes special care in combing their submissions because new authors are their lifeblood. This is particularly true of smaller agents who are on straight commission rather than a salary. 7. What sort of books do publishers and agents want? Publishing is a business and therefore what is wanted are books that will sell. The difference between the commercial writer and others is the former writes for a readership and others often just for themselves. A book has to be shaped to fit market needs and has to be of interest to as many people as possible. It should have popular and international appeal, have a potentially long shelf-life (journalistic books are often out of date before they are even published) and be of interest to film companies and, if non-fiction, to newspapers for serial. Serial rights can sometimes be worth ten times what the book rights are worth. Well-known people have an advantage, because they can be more easily publicised, and agents are always looking to tie a book into a television series. It is difficult to anticipate trends in publishing, not least because the book commissioned today may not be delivered until next year and published the year after. That said the boom in history and especially narrative, military and social history, popular science and literary fiction continues. Some 100,000 books are published each year so there is plenty of scope for variety. It is always worth studying book reviews, catalogues and the Bookseller's Spring and Autumn supplements, which gives details of books to be published in the following six months, to determine exactly what is being published and by whom. 8. What sort of books do publishers and agents not want? Unless one is a household name or has had a particularly exciting life or miserable childhood, steer clear of autobiography. Equally the fact one has backpacked to India does not necessarily mean one can turn one's experiences into the travel book we have all been waiting for. The market for poetry, political polemics, books on obscure hobbies and novels set in the worlds of accountancy or journalism is limited. 9. What should one submit in the first instance to an agent? Most agents only accept submissions by email, which should consist of a cover letter, synopsis, and some sample material. Additionally for non-fiction they may ask for an author profile, a short note on competing books, sources, and possible marketing outlets. 10. What is a book worth? A book is worth what a publisher will pay for it. They are more likely to buy it and for good terms if it is represented by a good agent.